How much do you know about your driveway? Unless you're a paving pro, you might have a lot of asphalt driveway questions, especially if you're just getting started with this building material. Even those who have owned asphalt for years can always learn more. To become more knowledgeable about asphalt installation, maintenance and replacement, check out this FAQ guide. What Are the Benefits of Installing an Asphalt Driveway? Asphalt is a reliable choice for both residential and commercial driveways. This construction material is durable, and its flexible nature helps it withstand freezing temperatures. With proper maintenance, an asphalt driveway may last 10 to 15 years or even longer. Asphalt is also attractive. Sealcoating can restore the deep black finish of a driveway, so you can refresh its look time and again. This process can help patched areas blend with the color of the rest of the driveway. An asphalt driveway is more affordable than a concrete one. In many areas of the country, a square foot of concrete is nearly twice the price of a square foot of asphalt. When Can Asphalt Be Laid? There's not a hard-and-fast rule about the correct temperatures for laying asphalt because there are multiple factors at play, including how hot the asphalt mix is to begin with and how thick the asphalt layers will be. 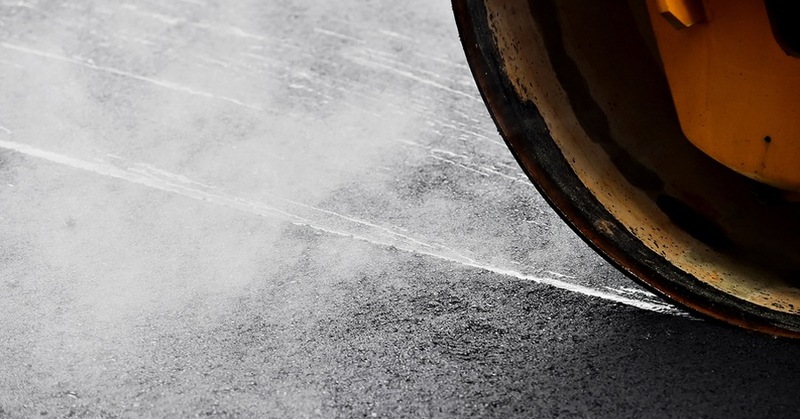 As a general rule, though, asphalt shouldn't be laid in very cold temperatures because the mix may cool down too much before it is properly compacted. It is better to wait until the winter chill has left so both the ambient temperature and the surface temperature will be warmer. You may hear the suggestion that the air temperature should be at least 40 degrees in the shade, but your experienced contractor may rely on different guidelines to determine the best installation weather. How Long Does Asphalt Take to Cure? Because asphalt is an oil-based product, it doesn't fully cure until all the liquid in the mix hardens. This can take 6 to 12 months or even longer. However, this is not what most people are actually asking when they inquire about cure times. What they actually want to know is how long it will be before they can drive on their new surface. In general, it's a good idea to wait about 5-7 days before driving on a freshly laid asphalt driveway. Your contractor may advise a slightly longer waiting period based on current weather conditions or other environmental factors. Are Tire Tracks on Asphalt Normal? Asphalt surfaces may show marks from tires. It is especially common for them to appear during the first year or so that it takes for the driveway to fully cure. These are perfectly normal. Tire marks are not an indication that the surface was improperly installed. Usually, these marks will fade over time. Even indentations typically smooth out after a while. How Does Winter Weather Affect Asphalt? Asphalt has a natural flexibility that helps it withstand winter cycles of freezing and thawing. This makes it a good choice for driveways in cold climates. Even still, if water is allowed to get into the asphalt, it can cause damage when it turns to ice. Therefore, it's a good idea to perform necessary maintenance before the weather turns cold. Have cracks and holes filled, and if you're due for a sealcoating treatment, schedule the work to be done before the temperature drops. You should also do your best to keep standing water from accumulating on your driveway. Shoveling snowy driveways regularly is one of the best ways to accomplish that goal. De-icing salt isn't as hard on asphalt as it is on concrete. It's reassuring to know that you can use this maintenance product as necessary during the icy months. However, using an overabundance of it or letting old salt stand all winter may eventually start to break down the surface, so moderation is still recommended. What Maintenance Does Asphalt Require? Although asphalt is durable and flexible, cracks and holes can happen from time to time. It is a good idea to have these repaired as soon as possible. Prompt maintenance will prevent them from becoming a more serious problem. Most experts recommend sealcoating asphalt every few years. This treatment is applied to the top of your driveway. It helps seal any small cracks or holes in the surface that could otherwise become larger cracks, and it helps keep water from permeating the asphalt. Sealcoating also restores the dark color of fresh asphalt. Sealcoating is a maintenance process. A thin layer of liquid sealant is placed over the top of an asphalt driveway. This protective coating helps fill in small cracks and gives the whole surface a deep black color. One or two layers of sealant may be placed on the driveway. The process is often done by hand to ensure that the product goes on evenly and fills in all of the small cracks or openings in the driveway. Resurfacing is a repair process. It involves laying down an entire layer of asphalt. This is a good middle-ground treatment if your driveway is in need of serious work, but you aren't yet to the point of needing a full replacement. Resurfacing may add another two inches of asphalt to the driveway. Often, some of the old asphalt must first be removed. This practice, known as milling, is especially common around the edges of the driveway. ​Is It Better to Replace or Repair Asphalt? It can sometimes be hard to decide whether you should have your driveway resurfaced or have it entirely replaced. One of the first factors that you should consider is the age of your driveway. If your surface is approaching the end of its expected lifespan, it usually makes more sense to go ahead and install a new one. Major repair needs are another sign that replacement is the right choice. If your driveway is in serious disrepair, it can be more affordable to simply replace it than to try to fix each problem one by one. If you have other asphalt driveway questions, your local asphalt contractor is the best source of information. A good contractor will welcome your inquiries about repairing or replacing asphalt. To learn more about asphalt paving in the Bellport, New York, area, reach out to us at Palermo Paving.